U.S. House Speaker Nancy Pelosi cancelled plans Friday to fly commercially to Afghanistan after her office said President Donald Trump announced the sensitive travel plans, significantly increasing the security threat on the ground according to a State Department assessment. A spokesperson for Pelosi’s office said in a statement "the administration had leaked the commercial travel plans as well." Trump revoked the use of a military plane for Pelosi and Democratic members of Congress’ planned trip to Afghanistan and Brussels late Thursday, the latest maneuver in a bitter political battle over the longest government shutdown in U.S. history. 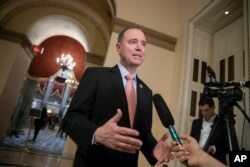 FILE - Rep. Adam Schiff, D-Calif., ranking member of the House Intelligence Committee, takes questions from reporters at the Capitol in Washington. The back-and-forth between the White House and the speaker of the House meant there is no end in sight for a partial federal government shutdown, which will soon enter its fifth week. The shutdown was triggered by a standoff between Democrats and Republicans over funding for construction of a wall along the U.S.-Mexican border. Pelosi, the top-ranking congressional Democrat, said Trump's "insistence on the wall is a luxury we can no longer afford." White House Press Secretary Sarah Sanders said the president wanted to make sure "his team can assist as needed" during the government shutdown. 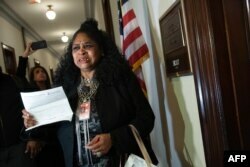 Faye Smith, a furloughed Smithsonian contract worker who has not been paid during the partial government shutdown, holds an unpaid electric bill to present to Senate Majority Leader Mitch McConnell's office on Capitol Hill in Washington, DC, Jan. 16, 2019. "Not only are these workers not paid, they are not appreciated by this administration," said Pelosi, who leads the Democratic majority in the House of Representatives. "We should respect what they do for their country."